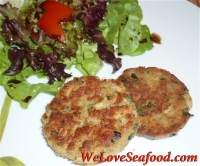 Combine crab meat, Old Bay seasoning, salt and pepper. Stir. Add Worcestershire sauce, egg and mayonnaise. Stir entire mixture. Crumble day old bread into separate bowl. 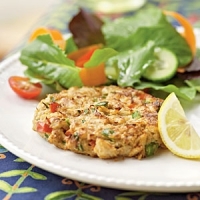 Gradually add to crab mixture, until you can form crab cakes without them breaking apart. 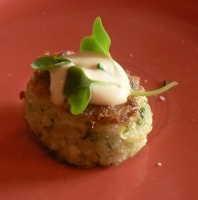 If too much bread crumbs, add more mayonnaise, until consistency is okay to form cakes. Pan-fry on top of stove until brown or broil in oven broiler until done.